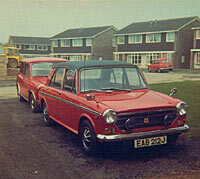 Morris 1100 & 1300 saloons ADO16. Homepage. 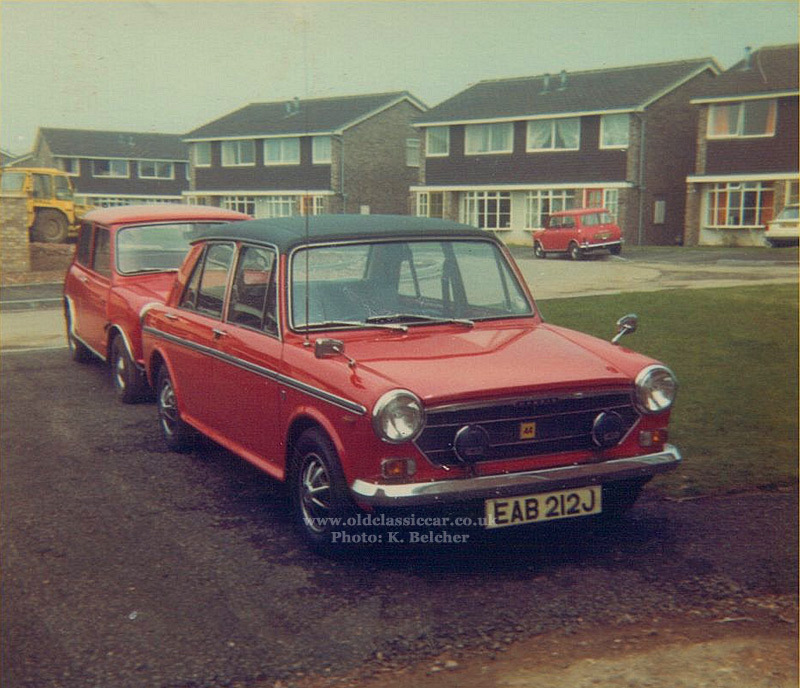 This page: A shiny new Morris 1100 seen in the early 1960s, plus other original photos. Morris 1100, registration 6 LG. Over 800,000 Morris 1100s were built yet how often do you see one now, outside of the classic vehicle shows?? and that figure doesn't include the million+ Austin versions, and all the other badge-engineered variants that were created around the basic ADO16 design. Corrosion, the enemy of most old cars, saw off 1100s in their droves, many before they were very old at all. Subframe and bulkhead corrosion were the killer rotspots for the 1100, crusty wings and arches looked bad but would not automatically have consigned a car to the scrapyard. 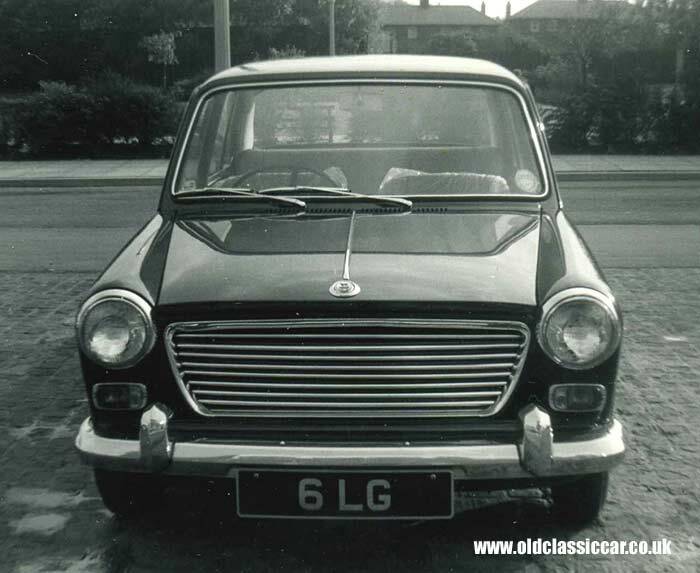 The 1100 was the brainchild of Alec Issigonis, the man behind the Morris Minor and Mini of course. He applied many of the principles seen in the Mini, and re-worked them to suit this slightly larger car. Again the A Series BMC engine was mounted transversely, driving the front wheels. Interior packaging was such that the interior was light and roomy, as with his other designs (the larger 1800 range was also surprisingly capacious inside). The 2dr Morris 1100 and sporty twin-carb MG 1100 were first off the blocks in 1962, with a 4dr Morris following later that same year. 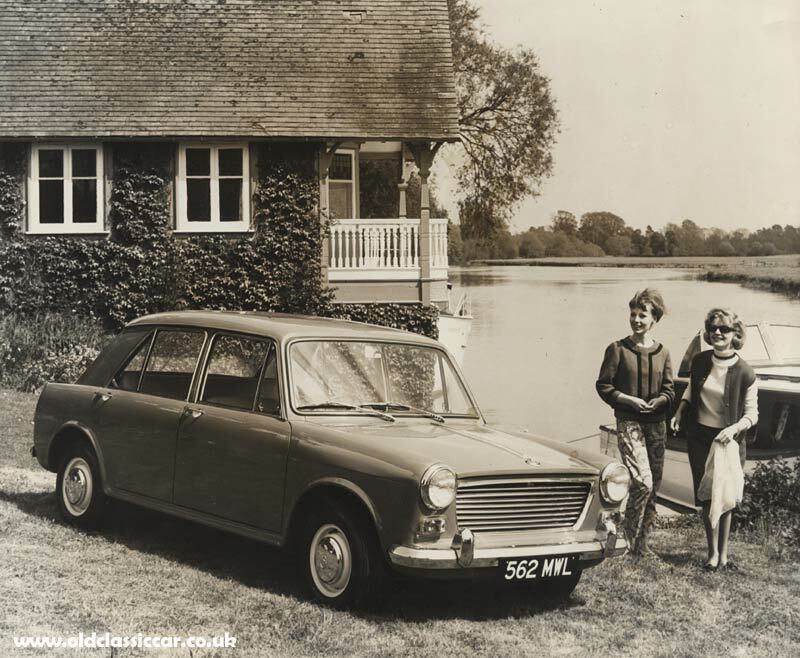 To keep Austin buyers happy (brand loyalty was a big thing back then), an Austin-badged 1100 was produced, with sales starting in the Autumn of 1963, alongside the established Morris version. Further re-works of the ADO16 would see Riley, Vanden Plas and Wolseley variants join the party, again aimed at loyal buyers who still remembered the marques prior to joining the BMC combine. Three 'Marks' of 1100 and 1300 would appear throughout the production run, which came to an end in 1974. 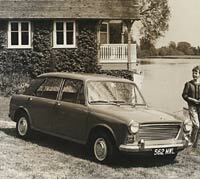 Estate cars, known as the Countryman (Austin) or Traveller (Morris) could also be ordered, from 1966 onwards. 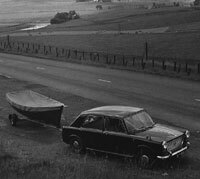 I'd be very surprised if the car shown below still exists, although the RAC vehicle check suggests that the distinctive registration lives on, applied to a Mercedes-Benz. Look closely and this Morris 1100 still has the clear plastic covers fitted to the seats. It looks to be in completely standard condition, perhaps its owner had never clapped eyes on the BMC Accessories leaflets that were available at the time!? 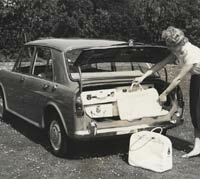 Life-long car fettler and classics owner David Kiss sent over the following two press photographs. 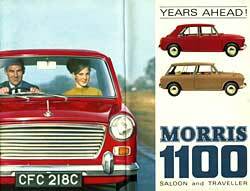 Both are staged BMC press images, and presumably were printed at about the time of the Morris 1100's launch. The first sees four-door car registration 562 MWL parked alongside a waterway, with two glamorous young ladies in attendance. 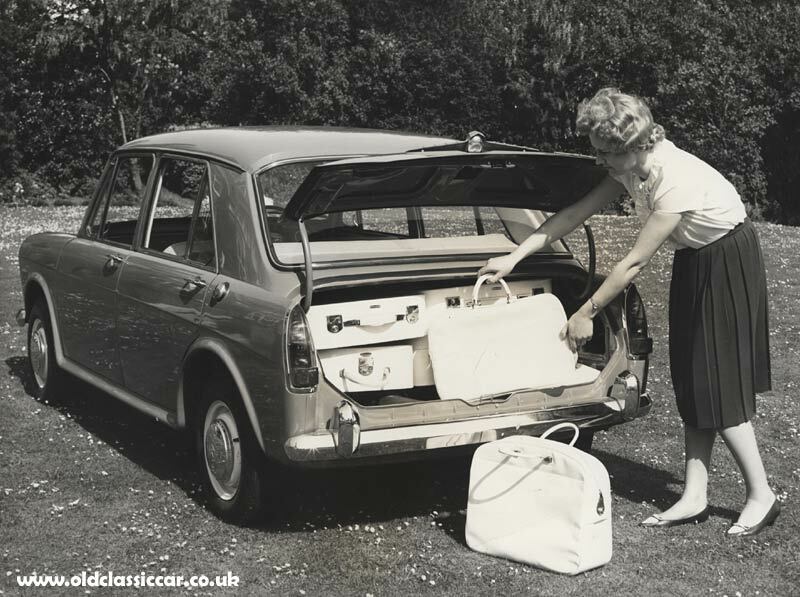 Next, the 1100's capacious boot area, as demonstrated by another lady and her extensive collection of Revelation-branded suitcases and holdalls. Just one bag remains to be inserted before the lid is closed, hopefully it hasn't brushed against the grubby end of the centrally-positioned exhaust pipe, a feature of the ADO16 cars. 3. ADO16 on towing duties. Thanks to Peter for this next period shot. Here we see 317 HUS, a car that his father purchased after Peter's sister wrote off the family's Humber Hawk. 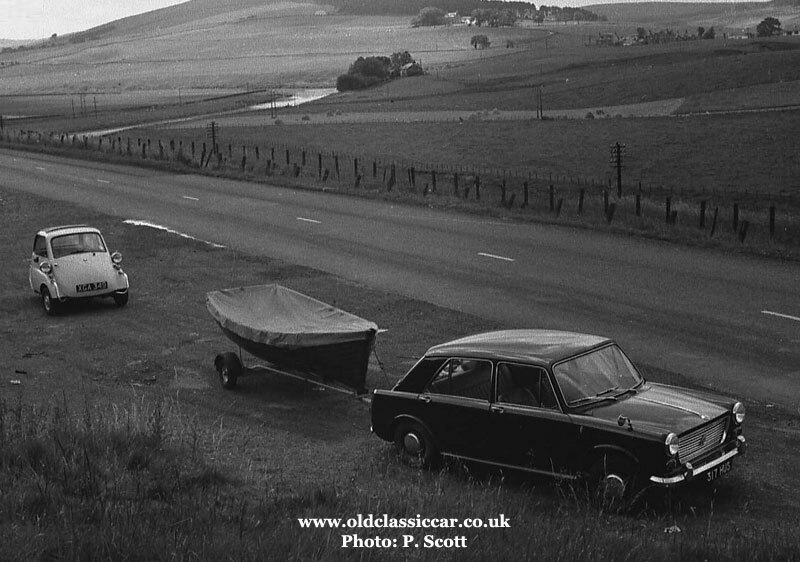 The Morris 1100 is shown towing a small boat, on the way home from a family holiday in Kirkcudbright, Scotland. 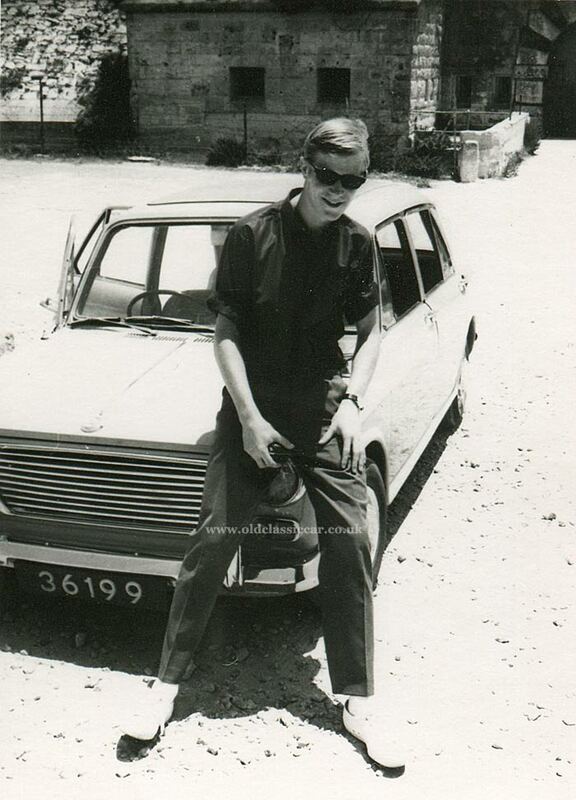 Peter's first car, Isetta registration XGA 349, can be seen in the background, for which he seems to remember paying 50 GBP. 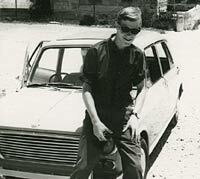 The photo was probably taken in 1966, in which case the 1100 was about three years old at the time. Thanks for sending the picture over. 4. 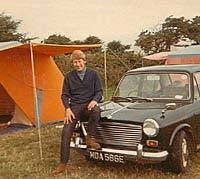 Morris 1100 at a campsite. 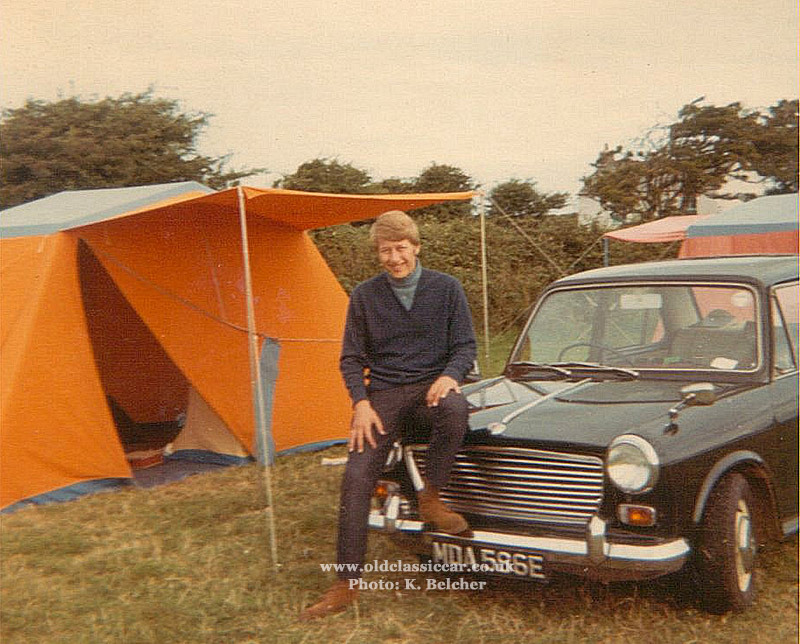 Two ADO16-related photos from Keith's own collection now, starting with himself posed with an E-registration four-door Morris 1100. His suitably period tent is also in evidence in this campsite scene. Thanks for the photos Keith, if anyone else has motoring photos from this period they're willing to share, please get in touch. Next, a right-hand drive four-door Morris 1100, sporting the distinctive registration number format 3619 9 (which I'm told is a Guernsey number, thanks Peter). Bar the fitment of a full-length Webasto-type sunroof, it looks like a standard example. I'm surprised that the roof isn't open, as evidently it was a bright sunny day - the gent in the photo is sporting a set of shades, and well-pressed trousers. But who is it? and where was this photo taken? 7. Side-on view of a Morris. 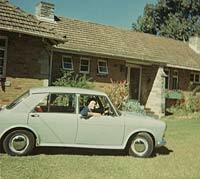 A bright sunny day complements the shining bodywork of this early Morris 1100, a four-door example with a lady sat behind the steering wheel. Where the setting is I don't know, the bungalow in the background looks to be of (then) fairly recent build, although the roof tiles do show some age to them, pointing to the property not being brand new at the time. 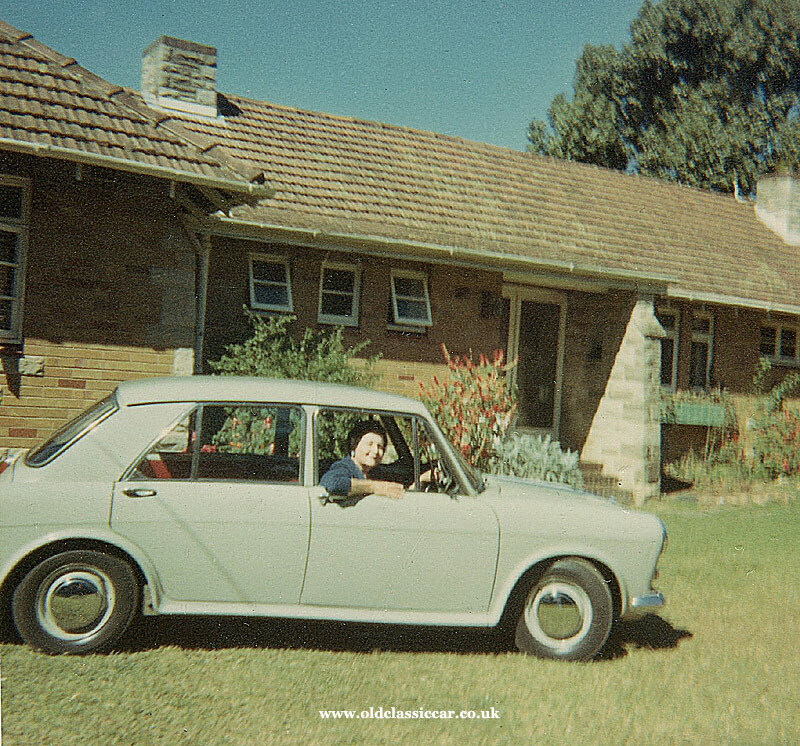 Return to Old Photographs of Cars - Page 4.